The ATH-SR5BT Wireless on-ear headphones give you phenomenal Hi-Res Audio with the convenience of Bluetooth wireless technology operation. Up to eight devices (smartphones, tablets, music players, etc.) can be stored in the memory of the ATH-SR5BT for quick connection to your chosen devices. 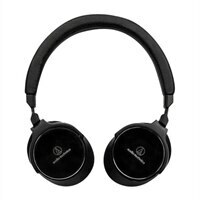 And adding or replacing devices is made even easier with the headphones’ NFC (Near Field Communication) functionality: just touch any NFC-compatible device with Bluetooth wireless technology to the N-Mark on the headphones and the device and headphones are automatically paired and connected. The ATH-SR5BT features powerful 45 mm drivers and comes equipped with a mic and volume/control switch built into the left earcup, making it easy to answer calls, adjust volume and handle playback (play, pause, fast-forward, reverse, next/previous track) of music and video on compatible smartphones and other portable devices. A smartphone cable with mic and controls is also here to provide a standard wired connection in areas where use of Bluetooth wireless technology is prohibited, for when battery power is low, or when Hi-Res Audio (5 – 40,000 Hz frequency response) is desired.